“Suckers’ tent” activists fed up with politicians on the Left. “Give up your egos, not the country,” they call. The heads of the “Suckers’ tent” protest have started a campaign aimed at figuratively knocking heads together on the political Left. Activist leaders Boaz Nol and Idan Miller say left-wing leaders are putting their egos ahead of practical need. “The example you’re setting right now is that your ego, not the good of Israel, sets the agenda,” the two wrote in a missive to the heads of several parties. 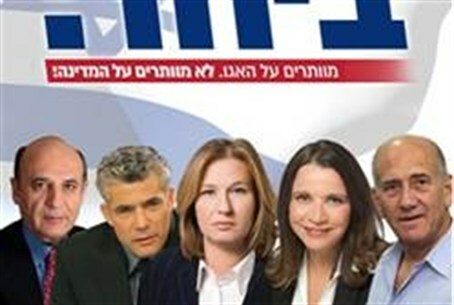 “Anyone with sense can see that opposite the unified forces of Bibi and Lieberman (‘Biberman’) and the establishment of the ‘Likud Beyteinu’ party, there must rise one party, large and unified, that will integrate all the forces on the center-left and will provide a real national alternative,” they argued. The letter was sent to MK Shelly Yechimovitch, head of the Labor party, MK Shaul Mofaz, head of Kadima, to Yair Lapid of the new Yesh Atid party, and to former Foreign Minister Tzipi Livni and former Prime Minister Ehud Olmert, both of whom are rumored to be considering joining the race. Activists appear to have snubbed Defense Minister Ehud Barak, who split from Labor to form the new Independence party.